Can't wait to feature here the new design of our living room. I've mentioned on my previous post that we are doing a "home make over" and currently, it's still in progress. I will be posting here the actual pics once it's completed. Meanwhile, I was just communicating with the family on how they are doing things. Sometimes, they do consult me for some ideas and they just send me some sample pics for our agreed colors and design. Recently, my son sent me sample pics of the actual color of the living room and dining room that he is actually trying to figure out. 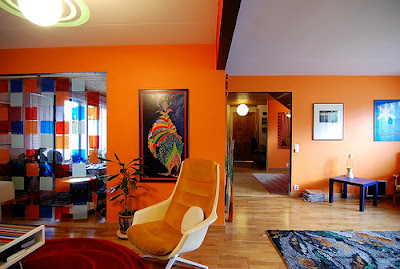 These pics are orange themed living rooms courtesy of getgreenhome.com. On the second thought, I like orange! It's actually my favorite color next to pink and lavander. I am a lively person and I always like things that are bright and colorful. Thanks for the visit Faye!